He joined the family company, Illycaffè S.p.A:,in 1977 and mainly focused on the re-organisation of the commercial structure. During the second half of the 80’s, he became the Sales director and chose to reassert the uniqueness of the blend, returning to producing a single blend. In those same years, he reestablished and started up a network of Sales Organization in Italy as well as abroad. He also developed marketing and communication activities and redesigned the business logo. He extended product sales to the alimentary channel and, with the industrialization of the coffee pod/serving, in the workplace channel. Subsequently, he raised to international sales director and re-organised the structure of the subsidiary companies. In 1992, he became managing director and in 1995, vice-president. Riccardo Illy is also journalist and author of a book, “Dal Caffè all’Espresso” published by Mondadori and translated in English, French and German, for which publication his brother Francesco produced the iconographic content. In 2006 he writes “La Rana cinese” (“The chinese frog”) and in 2008 “Così perdiamo il Nord” “So we lose the north”. In the past he has held the position of vice-president of the Associazione degli Industriali di Trieste (Industrialist Association of Trieste) and of president of the Seminario Permanente Veronelli From 1993 to 2000, he was Mayor of Trieste and in 2001 was elected MP in the Italian Parliament. 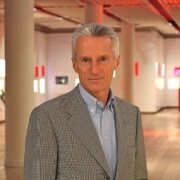 In 2003, he was elected President of the Regione Autonoma Friuli-Venezia Giulia, in charge until April 2008. In 2004, he was elected President of the Assembly of the European Regions. From 2008 to 2010 he was member of the High Level Group on Administrative Burdens of the EU in Brussels. From 1997 to 2002, he was president of the Comitato Promotore della Direttrice Ferroviaria Europea Transpadana (a committee dedicated to promoting a fast trans-European railway line via Northern Italy). In 2000, the President of the Republic of Austria conferred him the “Golden Honorary Title”. In the same year, he was awarded the degree Honoris Causa in Political Sciences at the University of Trieste. In 2009, Riccardo Illy was appointed Grande Ufficiale by the President of the Italian Republic. In the same year he is nominated IEDC-Bled School of Management Supervisory Board member.